Our technicians, animators and software developers work with world-leading designers and audio video integrators worldwide to create custom interactive installations. Content, design specs and program functionality can be tailored to support any product, promotional program or corporate initiative. We also offer consulting and application development services. 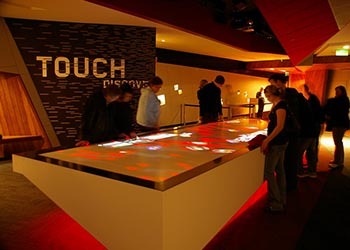 Multi-Touch Technology with Object Recognition Gives New York City Visitors an Unforgettable Interactive Experience. GestureTek brings the world’s largest multi-touch surface computing table to market at the Eureka Tower in Melbourne, Australia. GestureTek and Imagination USA installed an Illuminate interactive computing table for Samsung, creating The Samsung Experience. Meet Rima, the girl from the future! GestureTek’s multi-touch technology creates a head-turning interactive multi-touch retail window for Spanish telecom giant, Telefonica.